These last three statewide propositions includes the most dangerous and self-serving measure on the ballot in Prop 6, as well as two seemingly minor but important measures in Props 11 and 12. All three are easy decisions. Prop 6 is by far the worst proposition on this year’s ballot. It would repeal the Road Repair and Accountability Act of 2017, sometimes referred to as SB1, which increased taxes on gas and diesel to fund road and infrastructure repairs as well as transit investments. In addition, it would require a two-thirds vote of the people for any future gas tax increases. First of all, these funds are desperately needed to improve and repair our woefully neglected infrastructure. If you drive a car, you have no doubt experienced how dilapidated our roads are. If you don’t drive, you have likely noticed how inadequate and damaged infrastructure slows down transit, and makes it difficult to walk even short distances. Proponents of Prop 6 say that funding to repair roads should come from the general fund, which is either disingenuous or ignorant. Thanks to our history of single-issue ballot-box budgeting, the vast majority of the California state budget is already allocated to things like education and healthcare on a percentage basis. In other words, though the state budget has increased significantly since the depths of the recession (not exactly a neutral starting point either), most of that increase is required to be allocated to specific areas, and can’t be diverted to transportation projects. Even if the budget was more flexible, would you really want to pull $5 billion from our already underfunded education system, or from anywhere else? So we’re left with funding our transportation system through the gas tax, which had been the same flat rate of 18 cents per gallon since it was last increased in 1989. Adjusting for inflation alone, the gas tax would need to be more than twice that rate to have the same purchasing power it did in 1989, not to mention the fact that more efficient cars today use less gas, resulting in even lower revenue per mile driven. Any objective consideration of the facts makes it clear that we need new funding for our infrastructure, and it only makes sense that that funding comes from a reasonable adjustment in the gas tax. Perhaps the worst part of Prop 6 is the requirement that any future gas taxes be passed by a two-thirds majority vote of the people. But any tax increase already requires a two-thirds vote in the legislature, which is an incredibly high bar even with Democratic supermajorities in both chambers. SB1 required a lot of work and extensive compromise to gain the support of a Republican legislator, in order to make up for the two Democrats who voted against the bill. We shouldn’t strip the legislature of part of their job just because they made the hard choices that the voters would be unlikely to make on their own. Then there is the more insidious motivation behind Prop 6, rumored to be an effort on behalf of Republicans to motivate more of their base to the polls in a cynical attempt to stem the tide of the expected Democratic wave election. California desperately needs more funding to update our damaged roads, repair weakened bridges and tunnels, and improve public transportation systems. SB1 is an example of what our legislature can accomplish when they work hard to make difficult choices for the good of the state. Let’s actually enjoy the benefits of the hard work through improved infrastructure, rather than throwing it away for short term gain. Please, please, please, vote NO on Prop 6. Back in 2016, the California Supreme Court ruled that requiring on-call rest breaks violates state labor law. 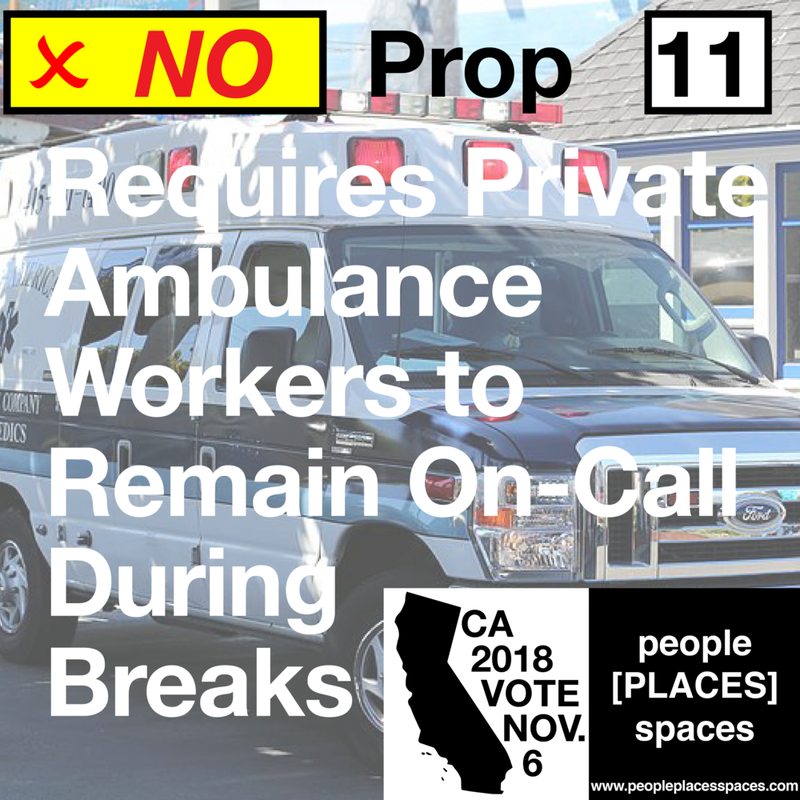 Though the ruling at the time only applied to private security guards, rather than try to meet the intent of California labor law, private ambulance service providers are attempting to amend the state constitution, through Prop 11, to require their employees to remain on-call during rest breaks. Our preference would be to honor the spirit of California labor law rather than changing the constitution to circumvent it. Furthermore, an “on-call rest break” is not really a break, and we would prefer our first responders to be fully rested and alert so they can perform their jobs to the best of their abilities. We shouldn’t sacrifice our labor laws or our safety for a few dollars saved on first response services. Prop 12 sets specific minimum space requirements for certain animals, including calves raised for veal, breeding pigs, and egg-laying hens. If this sounds remarkably like Prop 2, which passed in 2008, that’s because Prop 12 is essentially clarifying the requirements established by Prop 2, as well as adding calves raised for veal, and creating an enforcement mechanism for any violations. The voters of California clearly supported the intent of Prop 2, and Prop 12 is merely making the provisions of Prop 2 more clear, and more enforceable.